Finding the right gift or item to give a client that is useful, practical and will last for 20 years is not easy, but a Child’s Growth Chart for the wall with your branding on it is the perfect solution. 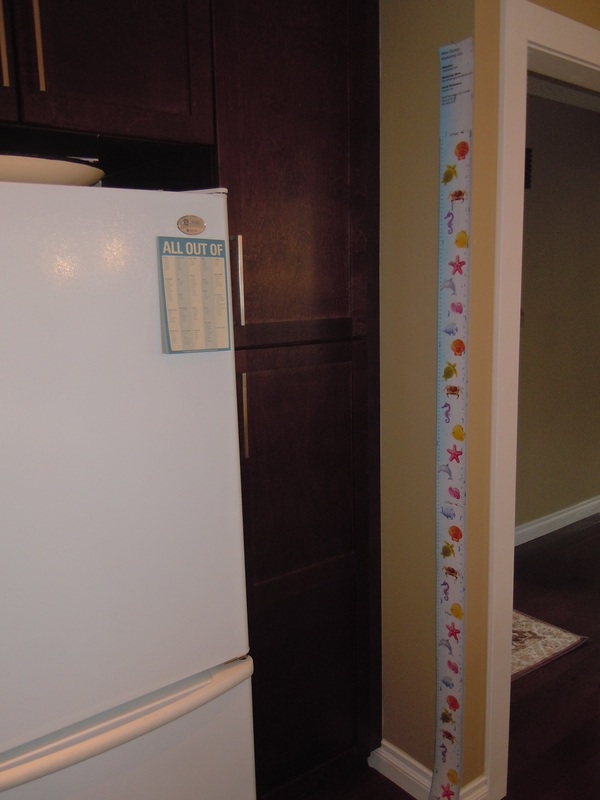 A memo pad lasts a few months; a calendar lasts a year, but a kid’s growth chart lasts a lifetime. It is the gift that they will cherish and every time they use it they will remember what a thoughtful gift it was. You can see by the images below that a wall, pantry door, door jamb or door trim are most commonly used, but the big drawback is you can’t take them with you when you move and they can detract from your decor. 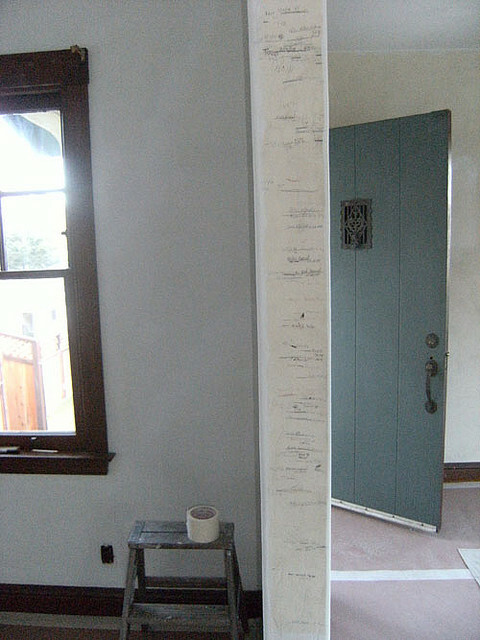 The other problem is that you are marking the height of your child, but unless you draw increments on the wall there are no measurements to determine how tall they actually are. We have the option of either peeling off the backing and sticking the wall chart to a surface or using a grommet at the top so it can be hung by a nail for easy removal. Store it out of the way and bring it out every few months to update the measurements. You can add a vertical phrase stretching up to 6′. Some examples are an insurance agent using the slogan “Growing With Your Family” or a slogan referring to the quality of service “Taking You to New Heights”, How do we measure up” etc. Branding can be added anywhere. You can use your own colors. Custom orders add $ 75.00 for one-time set-up. Our wall charts measure 6 feet from the floor and are marked in inches and centimeters. There is an 8″ space at the top for your branding for a total height of 80″. Check out these samples. Choose from our growing list of stock backgrounds or we can customize your wall chart with a minimum order of 25. The images are actual size; 4″ wide by 7.5 feet tall so you will have to scroll down to see the whole wall chart. It is hard to take the wall with you when you move and in newer homes the kitchen is usually part of an open plan concept so a wall with markings on it will detract from the room. 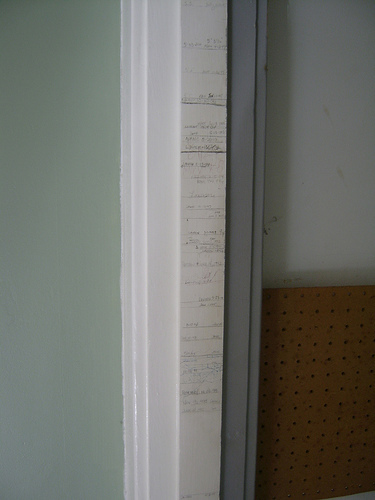 This is the least expensive way to measure your child’s growth, but it is hard to take with you when you move. Samples of personal branding can be viewed by clicking here. Call me, Mike Blaney at 604-618-5512 or 800-568-8338 if you have any questions or to place your order. There is no limit to what we can design for you. If you don’t see something you like give us some ideas and we will do our best to deliver.